Elaine Hancock (Olney, United States) on 1 March 2019 in Transportation. From the archives. Taken at Old Car City. J'aime beaucoup. Très belle photo Elaine. Elle est vraiment belle cette photographie. 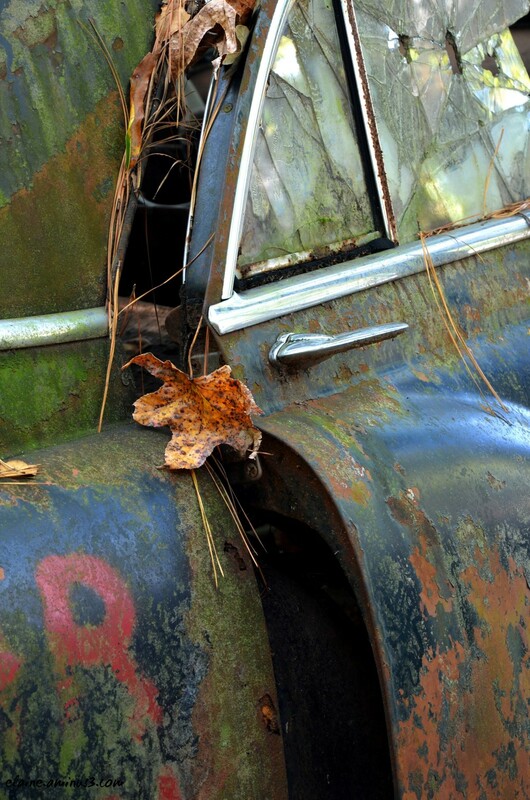 I do love rusting old cars! Nice shot!!! Superb framing , textures and colors ! With those bullet holes in the window, I half expected to see a skeletal hand sticking out. Love the rust and textures in this one. Wow, I like your way of framing ! A fine close up capture of the surface detsils. Very well done. That sad leaf says it all..
How pathetic this car looks !!!!!!!!!!!!!!!!!!!!! This could also have been a beautiful autumn photo, a superb detail photo. Beautiful framing, details, textures and colors ! I like the vintage and melancholic atmosphere ! Wow, textures and colors galore! It looks a little foreboding. Could there be something bad in there? OK, so I watch too much Dateline where they always find a body in a car. Superb mixture of rust and memories !